This recipe has been around forever. Well, as long as I've known that storebought frozen dinner rolls have existed. 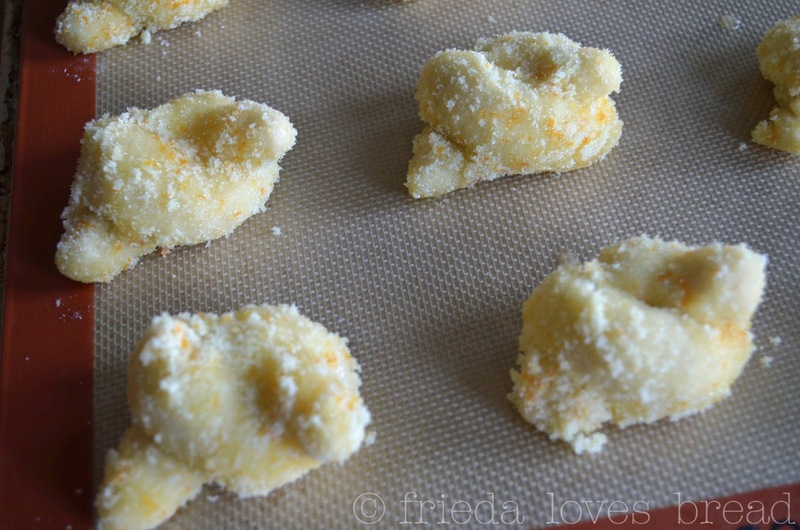 These orange bowknots have a crunchy, sugary/orange zest exterior. 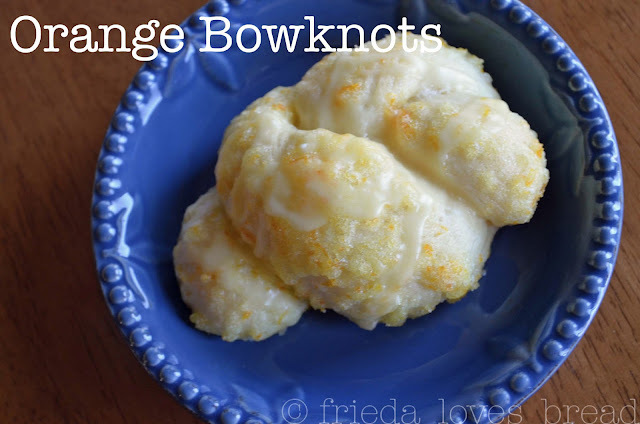 Making these orange bowknots are a two step dipping process that is quite messy, but produces a wonderful, crunchy orange crust. The rolls are shaped and dipped into melted butter. Then they are dipped into a mixture of grated orange zest and granulated sugar. Once baked, some of the sugary mixture stays on the roll, some puddles onto the baking sheet. I take the excess sugar mixture, crumble it up, and use it again on my next tray of rolls. 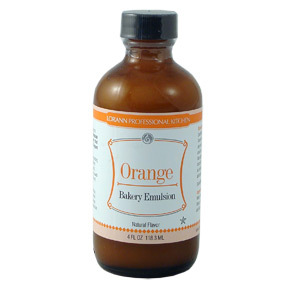 The orange emulsion added an extra orange flavor that made these rolls extra special! You'll have to try it! 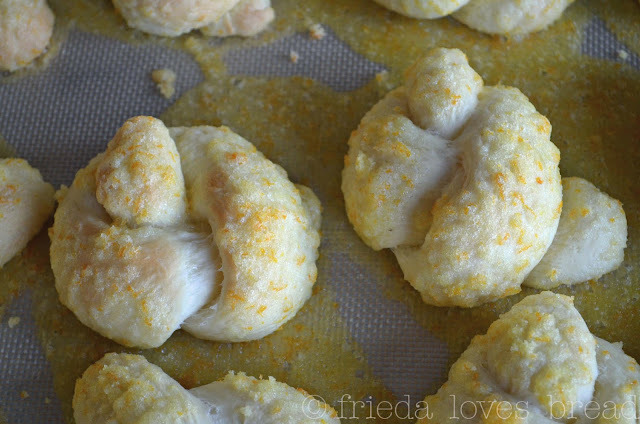 I have another orange roll recipe that uses fresh orange juice in the dough, along with freshly grated orange zest. 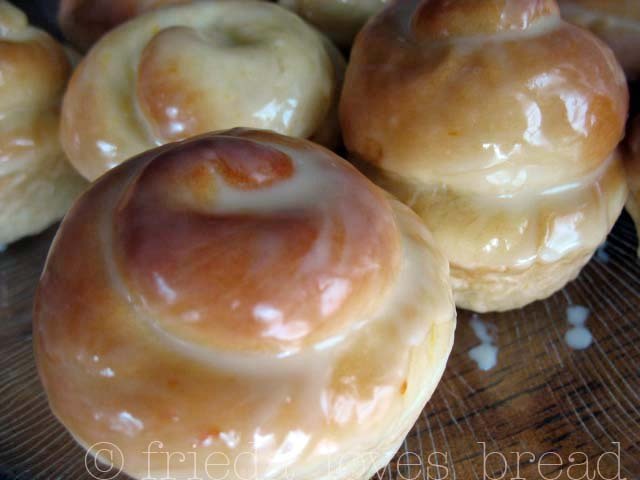 These rolls, like the bowknots pictured above, are drizzles with a fresh orange juice/powdered sugar glaze. 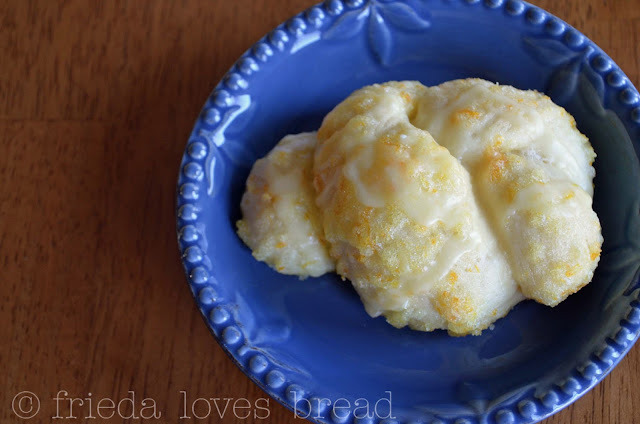 Both of these orange roll recipes are great; it depends on the texture that you want. Do you want a crunchy exterior, or do you want to bite into a soft, melt-in-your mouth orange roll? Make dinner roll recipe as directed and let it rise till double in bowl. In a small bowl, mix orange rind with granulated sugar. In a separate bowl, melt the butter. Roll each dinner roll into a 9” rope on a lightly greased work surface. Tie into a loose knot. Dip each roll into melted butter, and then into the sugar/rind mixture. Place coated rolls onto lightly greased baking sheet. Cover lightly with plastic wrap and let rolls rise till double in size. Bake rolls at 350°F for 15-20 minutes. Remove from baking sheet and put on wire cooling rack. Drizzle with orange glaze while still warm. Wowwwwwwwwwww! That looks AWESOME. Very very tempting.